Photo shows Paul and Jen working on a budget document (no, really!) using the free wifi available at the Shwedagon Pagoda, Yangon. Here’s a little more from the international team’s trip to Southeast Asia: we’ve already written about Myanmar’s first hackathon, but that wasn’t the only event we were able to attend. We were in Yangon at just the right time to be invited to the launch of the Open Myanmar Initiative (technically, this was the launch event for diplomatic circles, which made us feel rather grand). At the hackathon, second prize had gone to “Team Garlic” for their election fraud reporting app. So it was great to meet the OMI dev team, and discover that they were, in fact, one and the same. Go Team Garlic! The OMI, as well as running a website (currently in beta), have already produced a quantitative analysis on questions asked in Myanmar’s parliament. The team has done remarkable work, since the source data is from 22 thick volumes of printed, not digital, records of six parliamentary sessions. 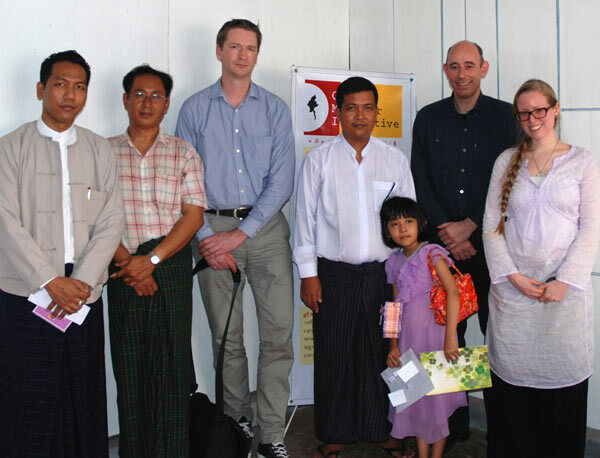 We met lots of accomplished, dedicated and interesting people while we were in Myanmar, and we know some of them will be putting bits of our open source code to good use. It was good to talk about technical matters too. It’s always informative to hear how people have approached the same kind of problems we’ve encountered (we’ve been running TheyWorkForYou since before 2006, of course, but we also actively work on parliamentary monitoring sites elsewhere in the world too). We know from meeting groups like this that the obstacles they face are always a combination of unique problems, entirely specific to their own parliament, and more general difficulties that apply to every jurisdiction on the planet. Or to put it another way, some people may go to Myanmar just to look at the pagodas — and although we did that too, even as we did so, at the back of each of our minds was the question, “I wonder if the administrative boundary data is available in KML format for this city?” Um, so… maybe we’re not quite like other tourists. After Myanmar, Dave went on to Malaysia to meet up with our friends at the Sinar Project. Sinar and mySociety have been in contact since they started running AduanKu.my (a FixMyStreet instance for Kuala Lumpur) last year and it was marvellous to see them again. They’re doing great stuff with their stretched resources, and recently have been working on getting Poplus components into their own parliamentary monitoring work — in fact we’re delighted that they will represented at the PoplusCon conference in Chile at the end of April.